"Field hockey at Wakefield High School began in 1926 as an interclass sport, due in part to a short season and weather conditions. In 1930, the Junior Class team was captained by Catherine Nichols. Miss Nichols became the coach during the 1937-38 season, her first year as a 'gymnasium' teacher. Miss Nichols was instrumental in bringing sports to the girls at Wakefield High School, introducing them to intramural basketball, field hockey, badminton, tennis, bowling, archery, and golf. She was inducted into the first Hall of Fame class at Wakefield High School in 1991. Intramural games continued into the 1950s before interest in the game began to wane. In 1961, WHS gym classes were 're-introduced' to field hockey, the same year that WHS began its first interscholastic season under the coaching of Mrs. Clayman. 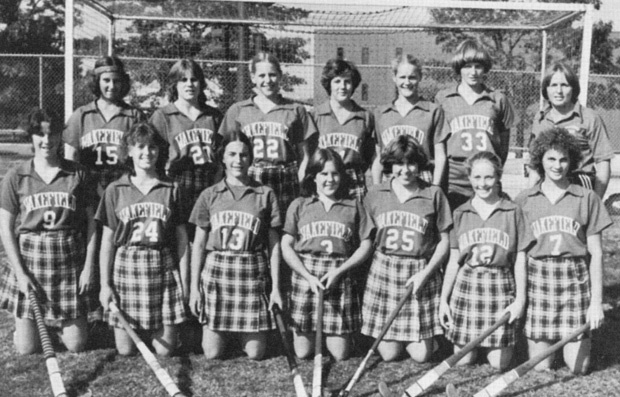 The WHS field hockey team, with a record of 9-1-3, won the Middlesex League in 1977, and again in 1980, with a record of 18-2 under Coach Brenda DeNinno. That year, the team led the league in the number of goals scored (59), least goals scored against (8), andmost shutouts (13)." -- Text from calendar. The 1980 Field Hockey Team won the Middlesex League title with an 18-2 record. (Front row, left to right) Susan Murphy, Alison Johnson, Donna Blasi, Lisa Guay, Helene Scott, Priscilla Daniels, and Laurie Mullen. (Back row, left to right) Denise Serrecchia, Marcia Pankratz, Jean Zaremba, Pam Guay, Melanie Horrigan, Renee Najarian, and Coach Brenda DeNinno. Marcia Pankratz went on to national fame in the sport as a member of the 1996 US National Women's Olympic team, and as the head field hockey coach at the University of Michigan. “Field hockey, 1980,” NOBLE Digital Heritage, accessed April 22, 2019, https://digitalheritage.noblenet.org/noble/items/show/6937.